The first mention of football being played in the village dates back to 1921. They played on one of Tyfrys Fields know as Cae Rhydlidd, which was close to Rhandir Terrace, near the link-road roundabout. On one occasion, they played a game against the rugby club and lost by more than 10 goals, and disbanded after a few years. 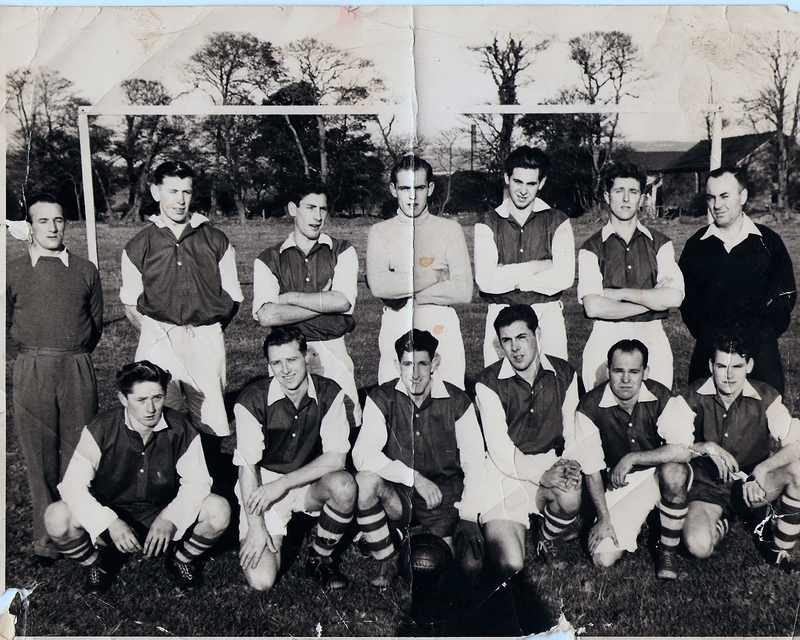 As far as is known, no further organised football was played in the village until 1956 when the Morlais Colliery workers formed a team which played on Morlais Field which is between Maes Road and the River Morlais. Sheep continued to graze on the field between matches to keep the grass cut, the goalposts were made by the workers in the wagon shed of the colliery, and no nets were used. The team played in blue and white strips, with their B team playing in green and white quarters. They were known as 'Bryn' and would change in the Castle Inn before walking over to the field for the match. They owned just one ball which was preciously looked after by the captain John "Jack" Samuel. The idea of forming a village club was thought up in the bar of the Bridge Inn in 1982. Former Chairman Barrie Williams and Swansea City defender Wyndam Evans were discussing football and when Wyndam asked how the team had faired the previous day he was shocked when Barrie informed him that there was no village side. Huw Johns, an ex-Llanelli player happened to be in the pub at the same time and was quickly in on the debate. Wyndam was adamant that a village the size of Llangennech should have it's own football team. A few hours later the idea of "Llangennech A.F.C." had been formed. Wyndam was obviously unable to participate any further because of his commitments with Swansea City, but had a lasting message for Barrie that the first kit should be in the same colours of Llangennech R.F.C. - red and black. Upon the news of a new team forming in the village, Llangennechites who were playing elsewhere returned home to help form their new club. Among the proud returnees were Mike "Shorts" Davies, Ricky Harper & Graham Banfield. The hard administrative work began and - after many a meeting with the League associates - Llangennech Asssociation Football Club were accepted into the Carmathenshire League. The Club's first game was a friendly away at Bwlch Rangers on 15 April 1982, where the side played in an all grey strip. Following the game the first club kit was purchased - red and black of course! The club went on to pick up its first league championship in 1987/88 - winning the Division Three title. The club has been honoured to have some big names associated with it over the years. As has been mentioned, former Swansea City player Wyndham Evans had a part to play in the founding of the club, but two more former Swans players have had spells as manager. Former Leeds goalkeeper Glan Letheran was first to arrive in the mid nineties and also played a number of games for the club. Then in 2002 the club shocked the local football community when it appointed 51 cap Wales international and former Swans and Stoke midfielder John Mahoney as its new Manager. John - whose Bangor City side faced the might of Athletico Madrid in 1992 - spent two years with Llangennech passing on his knowledge and experince to the young players of the club. Despite big name managers, it was a relative unknown who guided the club to its second league championship. Anthony Weston's side delivered the Carmarthenshire League Division Three title in 1997. Most recently, the club won it's first ever Cup competition silverware by beating Drefach 4-2 at Steboneath to lift the Darch Cup in 2017. Llangennech started the season with high hopes of promotion from Division Two after a promising Star Cup performance. However the first game of the season (a 5-2 defeat to Llandeilo after leading 2-0) epitomised the season that followed with inconsistency being the main theme. John Mahoney resigned as Manager and left the club in October with Richard 'Jack' Thomas agreeing to take over until the end of the season. The First Team finally finished in 7th position. This season is best remembered for the amount of debuts handed to youngsters from the previous season's under 16's. Former player Ray Thomas was appointed to the vacant position of Manager but unfortunately the club struggled against relegation for most of the campaign, eventually securing their safety with an emphatic 5-1 victory away to Llanelli Radicals in the penultimate game of the season. The season started brightly for Ray Thomas' side with back to back wins from their first two games, an achievement they could not replicate as they fell into Division Three after a miserable season. Simon Davies was appointed Manager in February but despite a remarkable effort could not halt the team's decline. With Simon Davies resigning as Manager due to family reasons, Richard Coslett was given the chance to move into the Managerial hot seat at the club at the beginning of the season. Five wins from the first six league games had everybody at the club believing promotion at the first attempt was a real possibility but the form was not maintained and key players departed. However these departures paved the way for the youngsters to stake their claim with Michael O'Mara and Paul Thomas particularly impressive as they helped steer the club to a 6th position finish. This season also saw the creation of a new Junior Committee which helped start 3 new mini-football teams in the village and earned FAW Accreditation. Richard Thomas and Simon Davies were appointed joint Managers of the First Team at the start of the campaign and quickly recruited several players to strengthen the side. The early signs were good with a giant killing in the Star Cup, beating Premier Division side Dafen in the group stage. That form continued into the league season with Llangennech winning 25 of their 28 league games acheiving promotion back to the Second Division and missing out on the Championship only on goal difference. Following the promotion from the Third Division, Davies and Thomas' side initially struggled in the higher division and at Christmas time found themselves bottom of the division. However a stark turn around in form saw them finish a respectable 5th place in Division Two. In contrast to the First Team, the Seconds started with blistering pace soaring to the top of the table by November. However their form fell away and ended up finishing 4th. The season will best be remembered for the achievements of the two junior teams particularly the Under 12's team. In their first season playing on the full pitch the boys reached the JH Evans Under 12's Cup Final and on 24th April 2010 became the first Llangennech side ever to run out in a cup final. Unfortunately they lost the match to Kidwelly Town who also pipped them to the league title but it was a huge positive step for the club. The club also formed a new under 14's team for the season and gradually improved throughout the season culminating in them winning the Bancffosfelen Plate Tournament playing in a tournament against teams one year older than themselves. The most successful season so far in the club's history. The first team, now under the leadership of former player Daryl Panayiotiou, won promotion to Division One after finishing as runners up in Division Two after a long promotion battle with Killay, Penllergaer and Trostre. The team also reached the quarter finals of the Senior and Challenge Cups, beating higher division opponents along the way. The second team had an inconsistent season and ended up 6th. The season also saw Llangennech's junior sides pick up silverware for the first time. The U13s completed a sensational league and cup double, whilst the U15s were beaten in their cup final and finished 3rd in the league. However it was a tough season for the U12s and U16s who struggled throughout. The club's mini section also went from strength to strength with more and more players joining the club. The U9s in particular saw great improvement as the season went along, ending up as one of the better sides in their conference. As the club marked it's 30th anniversary, the 1st team finished the season 4th in Division One - our highest ever league finish. The side also reached the semi-final of both the Star Cup and Challenge Cup to round off what was an excellent season. The 2nds struggled for consistency for much of the season and despite a strong start, finished bottom of Reserve Division Three. However, due to clubs leaving and entering the league, they were not relegated. History was made in our junior section, as our U14s emulated their efforts of the previous season by winning the league and cup double. The U12s, who initially struggled for numbers, ended the season strongly putting in strong performances against the division's top sides. Despite not picking up many positive results, the U13s also showed huge improvements this season, whilst our U16s ended their junior competitions with an inconsistent season. The club's mini section continued to expand and improve with increased numbers of coaches and players joining. The U11s and in particular the U10s picked up some impressive results, giving real hope for future success. After the promise shown in 2012, the club was disappointed to start the season by receiving the resignation of Manager, Daryl Panayiotiou due to work committments at the new Bryn Fish Bar. Curtis Roberts assumed the unenviable role of player manager but the squad was hampered by a string of injuries and circumstances going against them eventually finishing bottom of the table and finding themselves facing life back in the Second Division. Off the pitch, long-term Chairman, Ian Williams officially left the club to peruse his role as Chairman of Llangennech Community Council. However the club was unsuccessful in trying to develop a new second pitch in Llangennech Park due to the close proximity of the proposed pitch to the cricket square. Attention was immediately switched to Llangennech Schools playing field when it became apparent that the school would now favour the development to level their field. The existing facility presented a problem where the pitch sloped four metres down from one touch line to the other. The season started with the appointment of another former player, Andrew Kirkhouse as the club's Manager. Kirky strengthened the squad with some experienced players who followed him from Wellfield Athletic. Expectations were high but results were never consistent enough to mount a serious promotion challenge. The club eventually finished in 8th position. in the junior section, Mark Thomas' under 16s team completed their junior age groups and several players made their senior debuts towards the end of the season. The under 14s reached the cup semi-final and the under 12s reached the league championship play-offs. Before a ball was kicked in the 2014/15 season, the club received the news that it had longed for over the past 15 years. Funding had been secured to level the school playing field and provide a permanent home for Llangennech AFC. On Thursday 17th July, work began on the new pitch to everyone's delight. On the field, the Firsts were largely inconsistent and finished 9th, while Dean Bolgiani's Second Team had a much improved year, finishing in 3rd place. The club fielded ten junior teams including a girl's under 8s side for the first time. With Andrew Kirkhouse departing for Manager duty at high-flying Pengelli Utd, Dean Bolgiani took control of Llan 1st team. A tough season followed at the new home of Llan AFC but both teams maintained their status in Divisions 2 and 4 of the Carmarthenshire League. Mike O'Mara was identified as the standout performer of the season. The first team suffered a poor start to the season but the appointment of former player Nathan Phillips - brought in to play and assist the manager - boosted training numbers and increased the quality of technical sessions. A Darch cup run soon ensued and inspired Dean Bolgiani's team to an upsurge in form that saw them finish the season in championship winning form, eventually finishing outside of the promotion places. The historic cup run saw Llan beat unbeaten Div 2 leaders CKSV in a pulsating semi final at Dafen (https://youtu.be/XI8ESrTTo0M) which booked a final at Steboneath against Drefach. A man-of-the-math performance from Davey Lewis saw Llan run out as emphatic winners in a 4-2 win and lift their first cup silverware in history. The Reserves struggled to maintain a challenge in Division 4 without an official manager. The return of some former players saw Emyr "Big Ems" Williams given the player-caretaker manager role. The upsurge in the 1st team form rubbed off on the Reserve squad which saw results improve in the second half of the season with a respectable mid-table finish having completed all fixtures, which was a far cry from the position in November. The Youth team flourished in the league and reached the semi final of the Cup; some of the promising players to make first team appearances included goalkeeper Ben Matthews, midfielders Connor Morgan, Shaun Roberts, Kieran Rees, Peter Watts and striker Eray Wilson. Complications with some dispute over contractual obligations at the costly school ground saw the club withdraw their occupancy from their new home at the ultimately unsuited Llangennech Primary School to end of of the club's most successful seasons on record. Mike O'Mara, Davey Lewis, Jason Carrick, Drew Murphy-Jones & Jack Reynolds were recognised for awards at the annual presentation night. Hopes were high following the cup success and signings of some former players returning from premier league duty with other clubs. Dean Bolgiani and Nathan Phillips took charge of 1st team with Emyr Williams and Rhys "Rhino" Davies taking care of Reserves. However the 1st team began poorly and Bolgiani soon stepped down as manager. Nathan Phillips and Emyr Williams took control during a difficult spell while the winter took hold and many games were postponed due to the condition of the "Llan Siro" at the Park. Despite some improved performances, results did not fall and training numbers were poor throughout a season. Despite another cup run (this time in the Div 1 /2 Senior Cup) which saw the club lose 1-2 to Penygaer in the semi final at Graig's 3G pitch (https://youtu.be/N6DJgWqBR3s), the club's season fizzled out disappointingly. The season saw the first team finish bottom but one. The 18/19 season will see an overhaul of the league that will categorise Llan in CL Div 2. With Bolgiani briefly taking over the Reserve team manager role in October before - as the the club's first ever cup winning manager - left his role. Rhys Davies subsequently brought in former player Darren Dickeson to assist and the Reserves maintained a decent tilt at promotion; however, with the effect of the winter postponements meaning a grueling end of season schedule to catch up with, a mid table finish was settled for ahead of the CL revamp which will see Llan Resvs play in Resv Division 3 for 18/19 season. The club were without a youth team mainly due to a lack of an U16 coming through to support numbers. At a junior level, the clubs maintained teams at U6, 7, 8, 9, 10 & 13s. The annual awards night saw awards to Neil Bryant (1st team Player of the Year), Dan Evans (Player's Player of the Year), Peter Watts (Both 2nd team Player and Player's Player of the Year), Kieran Rees (Most Improved) John Peet (Commitment Award) and Emyr Williams (Clubman of the Year). Off the field, the committee went from strength to strength with recruitment and new sponsorship and participation ideas. In May, the club also become pivotal to the formation of the Llangennech & Bryn Sports Association, which is a community group set up to improve and manage grass roots facilities within the community for all sports. At the end of the season, long-serving club stalwart Kevin Brazel stepped aside as chairman due to work commitments. The club thank him wholeheartedly for his contribution and maintain that the door will always be open to his involvement in any capacity.